Not a horse today again guys, havent had much time to pick up the camera, I have been taking advantage of the good weather and gettting the barn tidied up. It becomes a dumping ground if you give it half the chance and that is how it looks now LOL. 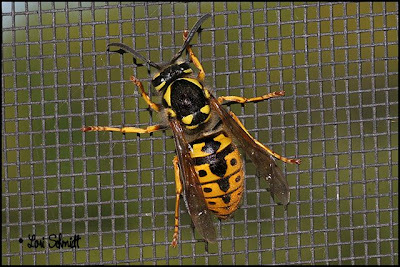 So here is a yellow jacket (hornet/wasp like insect that hurts like heck if it stings you). It was on the flyscreen of the kitchen window. Nice splash of color, but I let him go on his way after taking a number of shots. We are having clients coming over tomorrow to see Blaze (the foal that is in my profile picture with me but he is two years old now). I have always had a special feeling about this colt, he has the mildest, calmest most loving disposition out of any of the babies I have bred. Take for instance, I have not done very much with him other than to teach him to lead from the barn to the field so he is as stiff as a board LOL but when I took out the electric clippers to clip all his excess hair off around his hooves and legs and make a bridle path behind his ears, he just stood there like he had done it all his life!!!!! I was amazed, any other horse would have been climbing the walls just at the sound of them let alone the feeling they make when they are clipping. He wasnt too sure about the shaving the long hair in his ears but he did that too without too much resistance. I will get a nice photo of him tomorrow as he has nearly shed all his winter hair out and is filling out nicely, but I need someone to hold him so I can take the picture. If he is sold, I will take a goodbye picture of him too. I really hope that they like him he is so gentle. I went to look at the pasture down the road that we had the 4 mares at last year and the grass is long. I moved them there at the beginning of May last year but have held off this year. It needs to be cut so we are going to try to see if we can get it baled and then move the mares onto it. If we keep up the good rains it will sustain all of them adequately all summer. Well that is about it, muddling through each day, keep losing my to do list and then having to start another one!!!! The weather has been lovely, actually on the cool side, but mostly sunny, we seem to have avoided the bad weather again east and west of us. I'll cross my fingers and hope that Blaze has found a new home. Also that you get that field baled. That would be useful too!